Screen shines blue in sunlight? Wish I bought the standard version again, as in direct sunlight its hard to read my screen as it glows BLUE! Should had read more reviews before buying this version. Still a great product, easy to apply etc, same as my previous 'non' blue protector. saved my phone last time! Bought for my boyfriends iPhone 6s and whilst great quality and being easy to apply, it does not seal around the edges, I’m sure it won’t be long before dirt gets underneath it! The blue colour takes a bit of getting use to too! Difficult to put on and easily ruined while trying to re-position. Waste of money. Absolutely fantastic! Anti blue light on the protector is great, so much easier when you are in the light to see your phone screen. The installation was easy and instructions were clear. I’ve dropped my phone several times in the two weeks I’ve had the protector and there isn’t a mark or scratch on the screen. I also like that there is a rounded edge on the glass, stops it from catching on things. Better than any other protector glass that I’ve purchased before! 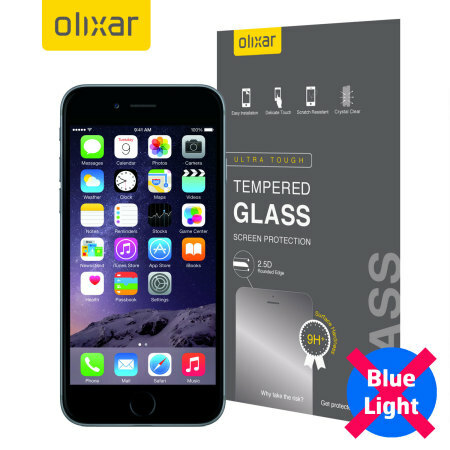 great product, easy to use and my iPhone 6s feels totally protected. Excellent product, works well with the blue light. Very good quality and comes with a proper pack for cleaning it. I bought a cover for my iphone 6 to block out blue light, and I can't tell the difference in my eye-strain yet. It has only been a week, but there is no discernible difference in the way my eyes feel. Were / are you you already suffering from eye strain Holly? If so, the main benefits of this are late at night or in low light situations when the screen's light is dominant. If you were not already suffering from eye strain or disturbed sleep after using your phone late at night, then you won't notice much difference but will still be benefiting from using this screen protector.